Because healthy air is a basic need, improve your quality of air at the office! We spend 90% of our time indoors, And 9 hours of each day we share this space with others. Public spaces, such as offices, are places where bacteria, viruses, dust, allergens, chemical vapors and odors can spread. We all know that it is important to wash your hands regularly, or to clean the surfaces that surround us such as tables, desks and worktops. But this is not enough. WE MUST ALSO CLEAN OUR AIR. And there are good reasons for this. what do you find in the air? In addition to all these bacteria and other allergens, there is also carbon dioxide (CO2) which is a component of the earth’s atmosphere. Although carbon dioxide is invisible and odorless, an increased CO2 content (> 1000 ppm CO2 concentration) in indoor air leads to FATIGUE, LOWER CONCENTRATION AND PRODUCTIVITY, INCREASE IN ABSENTEISM. 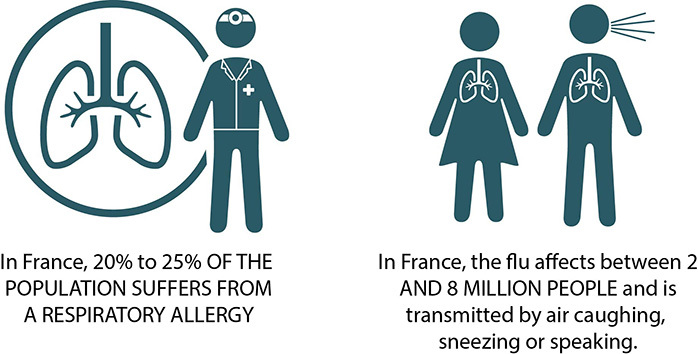 The direct cost of absenteeism for companies in France following various stops illnesses for influenza epidemics or allergies type pollen is about 45 BILLION D’EUROS. Simple and effective solutions exist to clean up the air of his office like airing one or two times a day your workspace. UNILUX will offer from 2018 R’PURE, an air purifier with an ionization system (more efficient than the traditional HEPA filter system and fan), eliminates 99.9% of harmful particles from the air so that you can enjoy Clean air and a healthier office. It is also compact, quiet and quiet (less than 50 db) and purifies the air on a total surface of about 15m2. A more inner air improves your cognitive abilities, (like concentration voting and your memory), reduces sickness absenteeism and improves your productivity by 8 to 11%. A healthy, clean air of harmful substances and strong odors demonstrates your concern for your employees and visitors and improves the well-being of your employees in your premises.